A wildlife group is trying to find a home for a giant European spider that has been caught in north Essex. 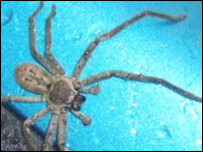 The Huntsman spider is bigger than any seen in Britain and measures up to four inches in length. Staff at a timber merchants in Maldon found the creature and although not considered dangerous it can bite. It is being cared for at an animal rescue centre in Great Wakering and the owner Iain Newby said it cannot be released into the wild. "It is totally against the law to introduce a new species into the wild in the UK that is not indigenous to the country. "I'm looking for a good home with someone who has perhaps kept tarantulas in the past."